This species is accepted, and its native range is S. Bolivia to NW. Argentina. It is used as a medicine. Cultivada en Colombia; Alt. 250 - 2800 m.; Andes, Llanura del Caribe, Orinoquia, Valle del Cauca. Alt. 250 - 2800 m.
Unnumbered illustration by B. Salvador y Caruna in Palau (1784), lectotype selected by Armada & Barra (1992: 89). 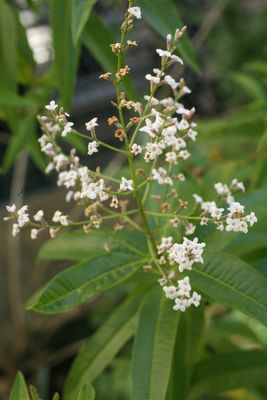 Inflorescence of 1 – several spike-like racemes from each leaf-like bract, each up to 6 cm in length, thus often forming a compound, lax inflorescence. Apparently native in northern Argentina (Salta, Jujuy, La Rioja and Catamarca) and southern Bolivia (Chuquisaca, Cochabamba, Potosi and Tarija), where it is a local, but sometimes abundant component of arid bushland in the dry inter-Andean valleys between 2300 – 3250 m. Also widely cultivated in Bolivia and throughout tropical and subtropical America for use as a herbal tea and in traditional medicine. A serrate-leaved form from Argentina was described by Moldenke (1964: 170) as a “distinctive species” under the name Aloysiasleumeri. Botta (1979: 102) reduced this to synonomy with A. citrodora after finding entire and serrate-leaved plants growing together in the same area. 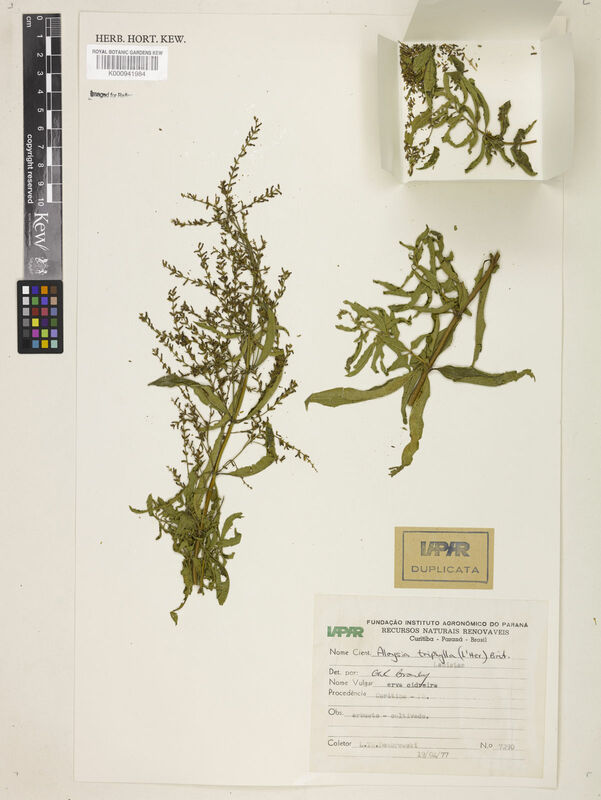 Serrate-leaved plants have never been collected in Bolivia. Synonym: Aloysia triphylla (L’Hér.) Britton (1925: 140). Synonym: Lippia triphylla (L’Hér.) Kuntze (1898: 253). Synonym: Verbena triphyllaL’Hér. (1786: 21). Type: C. L. L’Héritier de Brutelles.n. (P, n.v.), a cultivated plant grown from seed sent by Commerson from Montevideo, lectotype selected by Moldenke & Moldenke (1983: 232). The epithet citrodora is as spelt by the original author rather than the more common, erroneous and less logical citriodora. Synonym: Lippia citriodora (Palau) Kunth (1818: 269). Stems - Used in liquid medicines (Lagos-López 2007). Leaves - Used in liquid medicines (Lagos-López 2007). Stems and leaves - Used in liquid medicines as a sedative (Lagos-López 2007). Leaves - Used as a tonic (Alarcón 2011). O'Leary, N., Lu-Irving, P., Moroni, P. & Siedo, S. (2016). Taxonomic revision of Aloysia (Verbenaceae, Lantaneae) in South America Annals of the Missouri Botanical Garden 101: 568-609. Wood, J.R.I. (2009). Aloysia axillaris (Verbenaceae), a new species, with notes on the genus in Bolivia Kew Bulletin 64: 513-523. Alarcón, J. J. 2011. Plantas aromáticas y medicinales. Enfermedades de importancia y sus usos terapéuticos. Medidas para la temporada invernal. Bogotá: Instituto Colombiano Agropecuario.